The new Pooltest 9 Premier builds on the phenomenal success of its predecessor, offering even more great features. 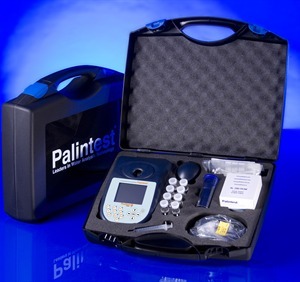 The Pooltest 9 Premier is quick and easy to use and is fully integrated with the Palintest tablet test reagents. Ensure the bather experience is always positive with accurate and reliable control of disinfection using the Palintest DPD method. Protect the infrastructure with Water Balance or Langelier Saturation Index test methods included as standard. The keypad allows a single button push to access the test of interest – just push and test. The Pooltest 9 Premier assists the test protocol with on-screen prompts. Whether downloading from the 100 result data memory or connecting the Pooltest 9 Premier to an external pool software system, the USB port can be used anywhere. See the Download tab for Com Port Drivers and instructions on how to use. Supplied in a hard case kit with room for all items required to start testing immediately. Take it out in the field as part of the service kit or install on the counter for a professional pool store test facility. Supplied with a two year warranty as standard, all users can access the decades of experience of pool testing and be secure in the knowledge that they are joining the largest pool photometer family in the world.